Sustainability is based on the simple principle that everything we need for our survival and well being depends, either directly or indirectly, on our natural environment. Sustainability creates and maintains the conditions under which humans and nature can exist in productive harmony. This allows the fulfillment of social, economic and other requirements for the present and future generations. Sustainability is important to making sure that we have, and will continue to have, the water, materials and resources to protect human health and our environment. 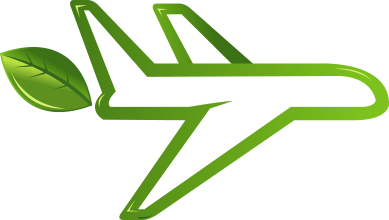 Commitment to Sustainability at DGX - Dependable Global Express The nature of our transportation and logistics business generates a large share of greenhouse gases. We are committed to reducing our carbon footprint, to increasing our effectiveness and capacity, and to being innovative in such a way that we make a positive impact on society. This will mean managing for the long term as well as the short term, developing strategies that balance competition and cooperation, and providing a service that meets social and environmental needs. For us, sustainability needs to be about ‘greening’—because businesses and communities depend on healthy, productive ecosystems. We have made it our mission to be the leader in our industry, and we invite you to share in this pursuit. 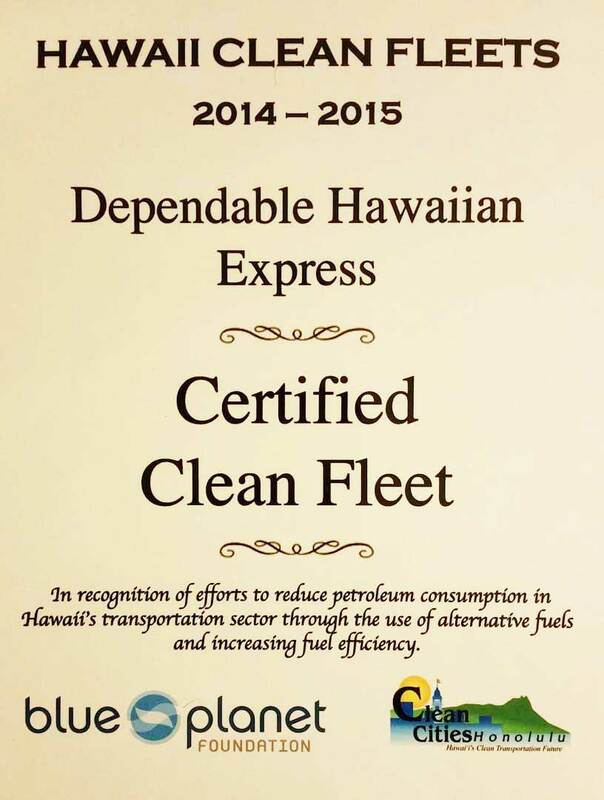 Read about our Fuel Conservation Program. Our Maui and Guam facilities are totally solar sufficient, drawing no additional energy from the electric grids. We have 2% sky lights at various facilities to use natural, rather than artificial lighting. We meet the California Air Resources Board’s “sparklist” requirements. In our Los Angeles headquarters we have installed five charging stations for employees to use to charge electric vehicles. We have installed lower-energy usage models for lighting, converted our Corporate Headquarters and Honolulu terminal lights to LED and use timers in Los Angeles to increase the energy effectiveness of our HVAC and lighting systems. We recycle paper in our Los Angeles corporate headquarters, our San Leandro facility and our Seattle facility. In Los Angeles, we also separate and recycle wood, plastic, metal and cardboard. We replaced our networking and computer server infrastructure after 2010, dropping energy consumption by 33% - 38%. In 2017, our Corporate headquarters will become solar energy efficient, reducing our electricity consumption from the grid by approximately 80%. Our Hawaii and Guam computer system was designed to allow both us and its users to be virtually paperless. 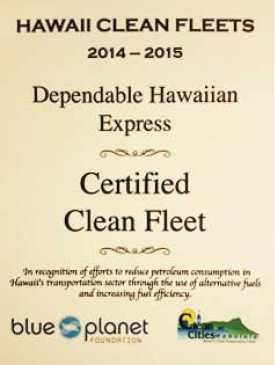 In addition to participating in EPA’s SmartWay Program, Dependable Hawaiian Express invests in an annual GreenWay Miles carbon audit, allowing them to define their complete carbon footprint. SmartWay carbon emission data includes only fleet emissions. However, facility operations are a major contributor to any trucking company’s carbon footprint and DHX’s carbon audit captures and combines both fleet and facility emissions. 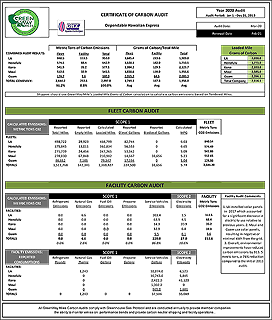 In addition to providing a complete accounting of their carbon emissions, DHX’s investment in a greenhouse gas protocol audit provides environmentally conscious shippers the ability to purchase carbon offsets* to offset emission levels or to ship freight on a carbon neutral basis. *Carbon offsets are investments in projects that reduce carbon emissions. We published No-Idling Policy, No Out-of-Route Policy and MPG goals for drivers. We sent a letter out to drivers explaining the new policy and MPG goals and how they tie into our Sustainability Policy. We monitor and manage individual truck MPG actual-to-goal performance. We compare driver performance on same-model equipment and use the ‘bottom 15%’ technique for managing and coaching worst performing drivers. We look for rotation opportunities and place highest MPG equipment on longest runs based on miles/month. Likewise, if we have idle equipment, we ensure it is always our lowest MPG performing equipment. During orientation, we train drivers on sustainability and review the above-mentioned policies/MPG goals and below-outlined driver activities to reduce fuel consumption. Reduce idling. Take every opportunity to shut off the engine. Each idle hour burns 8/10 of a gallon of fuel. A 100-truck fleet that reduces idling by 2 hours/truck/week will save 40,000 gallons of fuel/year, about $150,000 in cash, and will eliminate a volume of carbon emissions that would fill 4.7 fifty-three-foot trailers. Reduce highway top speeds. This may involve use of speed governors. Reducing speed by one MPH equates to an approximate mileage increase of 1/10 mile per gallon. Improve driving techniques. How a truck is driven will have a significant impact on MPG. Fuel-conserving driving techniques include: Smooth Shifting and Braking, Block Shifting (ex: from 2nd to 5th gear), Cruise Control and Progressive Shifting (upshift at lowest RPM possible). Maintain correct tire pressure. Make sure you frequently check tire pressure. Truck tires inflated 10 pounds per square inch (psi) below recommended air pressure levels can reduce truck fuel economy between 0.5 percent and 1 percent.